50, 60, 70 lbs. 26" - 30.5" 7.25"
How To Choose Arrows 335 FPS 80% 33.25" / 4 lbs. Welcome to our Martin Onza 3 review. This compound bow comes with features usually included in $800+ models. A fantastic tool for hunting with a very appealing design and supreme attention to detail. Very fast, very quiet and vibration fee, and with lots of other cool technologies. Long enough to be great for both hunting and target practice. Arrows and release are not included and you need to buy them separately. My Onza 3 came already assembled so I really can’t say much about assembly. I’m guessing yours will have already been put together as well, assuming you purchase it online (not sure about pro-shops). Martin’s Onza 3 comes with the Hybrid Nitro™ cam system. These cams are synchronized and connected together so that the entire system is self-correcting, allowing the nock point to move in a pretty much perfectly straight line. The control cam is on the top while the power cam is on the bottom limb. The system also allows you to reduce the let-off if you choose to do so. The rotating module is very clearly marked, making it fast and easy to change the draw length in half inch increments, from 27.5″ to 30.5″. Keep in mind however that the 27.5″ setting can be a little problematic, so it’s safe to say that the practical minimum draw length on the Onza 3 is 28″. The eccentric system comes with Martin’s TRG (Torque-Reducing Cable Guard). This is basically a simple system comprised of two plastic-like slots, within which the cables are free to move however they need to during both the draw and release. Since there are no regular slides, the cables move in a somewhat free manner, reducing cam lean and torque. The system can be easily fine-tuned through the bottom cam, allowing you to make changes to the back wall. As a result, you have a certain influence on the back wall and the size of the valley. The cams rotate around stainless-steel axles. Most archers, especially beginners, do not shoot under such conditions. Typically you are likely to use heavier arrows (usually 400-450 grain), maybe 60 lbs. of draw weight, and probably 28″-29″ of draw length. All of these differences will significantly lower the IBO speed of any compound bow on the market, though it doesn’t make a big practical difference. For a better understanding, see our article: What is your bows REAL speed?. The bow’s kinetic energy varies significantly depending on the draw length, draw weight, arrow weight, and a few other factors. Assuming you are using the most powerful settings available (70 lbs. draw weight, 30.5″ draw length), you can expect a 425 grain arrow to deliver 84-88 ft-lbs of kinetic energy. If you were to use the 60 lbs. draw weight version of the bow and have a draw lenth of 28″, the same arrow would carry 65-70 ft-lbs of kinetic energy. As you can see, KE can vary significantly depending on the settings of your Onza 3. The bow is a little tough to draw in the beginning of the cycle, but this changes after a few inches and then it draws exceptionally smoothly. As far as hybrid cam systems go, there is no hump/sharp transition towards peak draw weight. Overall a smooth and predictable bow to both draw and shoot. And if you feel the valley is to narrow for your tastes, you can always micro-tune it through the settings on the bottom cam. The bridged riser: is large and does a great job at dispensing excess energy, therefore significantly reducing vibration and hand shock levels. This compound bow comes with the SOS system, which stands for String Oscillation Suppressor. Compared to a regular STS, the SOS is comprised of a fork-like construction, with a string stopper inserted. The stopper does not dead-stop the string, however; it can move ever so slightly along with the string once you release. The advantage of this solution is that the string is not stopped so abruptly, increasing its life and actually reducing vibration even further. The Martin Onza 3 makes use of the VEM system, which stands for Vibration Escape Module. Installed right next to the arrow rest, its role is to counteract vibration resulting from the arrow hitting the rest upon release. This adds an extra layer of vibration reduction to the equation. Overall, a pretty quiet bow with almost ZERO vibration. The bow is somewhat long, making it more accurate than other shorter compounds. However, if you plan to shoot from a tree stand, make sure that the axle-to-axle length (33.5″) is not going to be a problem when maneuvering on the platform. slightly below parallel once the full draw is reached, contributing towards reducing riser vibration. The limbs are coated for extra durability, and it’s possible to adjust tension downwards by up to 15 lbs. So if you get the 70 lbs. draw weight, you can dial it down to as low as 55 lbs. if need be. As already mentioned earlier, the riser on the Onza III is bridged. Martin used the Saddleback thermal leather grip, with some carbon fiber around the edges of the grip. The advantage of Saddleback grip is that it retains temperature very well, which helps keep your palm warm when shooting in cold weather. I found the profile of the grip to be very comfortable to hold, and by the looks of it I think even people with huge hands should have no problem with stability. The bow comes with the HammerHead string, which is constantly kept under around 295 lbs. of tension. This means the string does not need time to “stretch out” before it can achieve optimal performance. Quick-lock stabilizer mount makes it very easy to attach and remove your stabilizer. Simply rotate the stabilizer clock-wise or counter-clockwise to attach it or remove it. I really love this solution by Martin and have found it to be very reliable – much more so than quick detach systems on other compound bows. Thanks for reading our review of the Martin Onza 3. If you’re looking for a compound bow packed with excellent features, a smooth draw cycle and tons of fine-tuning and adjust-ability potential, while also providing more than enough kinetic energy to take down an African elephant if necessary, get the Onza 3. 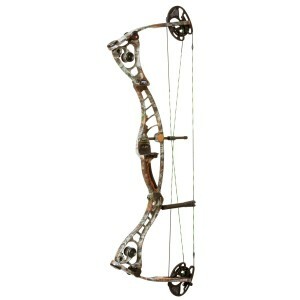 This is an excellent bow that rivals top models made by Bowtech or Hoyt. See Cabela's current price and customer reviews on the on the Onza 3 and start hunting in a few days.